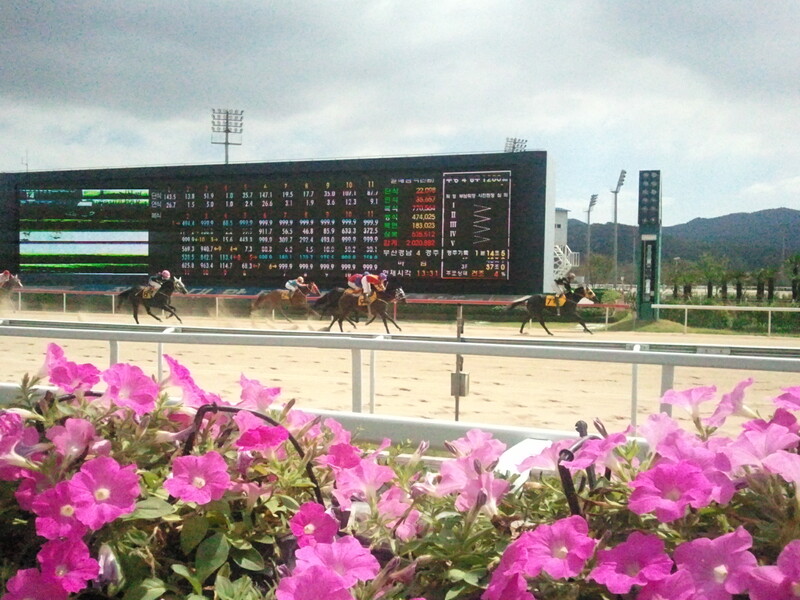 As of 2017, Busan holds live racing on Fridays and Sundays. There are 10-11 races on Fridays from 11:30pm-6pm (with simulcasting from Jeju) and 6 races on Sundays from 12:30pm to 5pm (with simulcasting from Seoul). 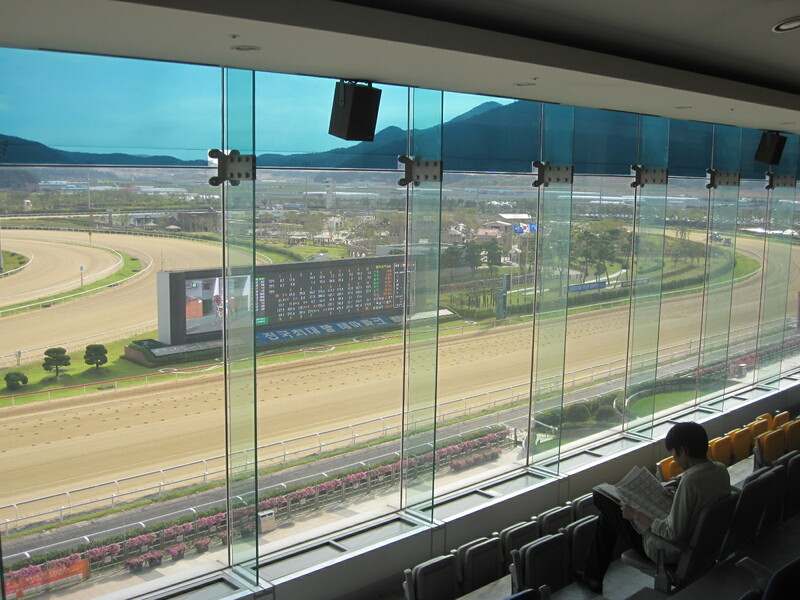 The track is also open every Saturday to show live simulcasting from Seoul. Busan Racecourse is not quite as easy as Seoul to get to if you don’t have a car – but it is very possible! Hadan Station (Busan Subway Line 1) Exit 1: From 10:00 and then roughly every 30 minutes. The last return shuttle bus leaves the racecourse 30 minutes after the last race (if arriving in Busan by KTX train into Busan Station, this is the best way to get there). 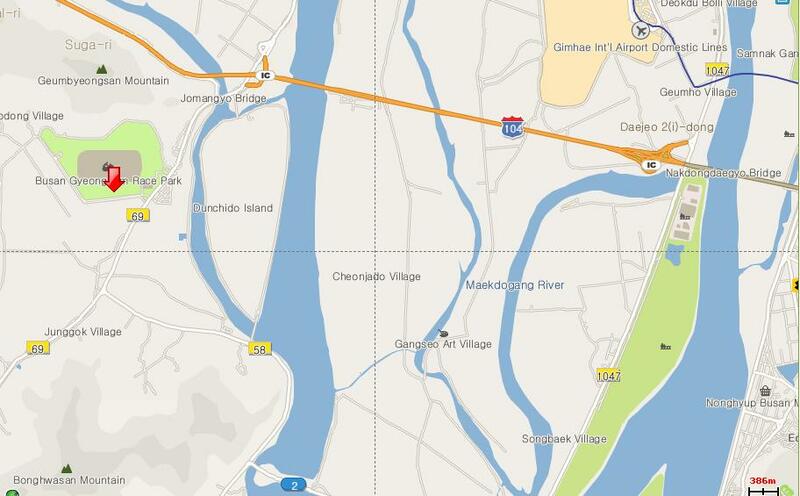 Jurye Station (Busan Subway Line 2) Exit 8: From 10:00 and then roughly every 30 minutes. The last return shuttle bus leaves the racecourse 30 minutes after the last race. Gangseo-gu Office Station (Busan Subway Line 3) Exit 5: From 9:50 then at 10 and 50 past the hour. The last return bus leaves the racecourse 30 minutes after the last race. Gimhae Arts & Sports Centre: From 9:50 then at 10 and 50 past the hour. The last return bus leaves the racecourse 30 minutes after the last race. Jangyu (Gimhae West Police Station): On the hour from 10:00 to 12:00. The last return bus leaves the racecourse shortly after the last race. * All shuttle bus schedules may change without notice. If you take a shuttle bus to the racecourse, as soon as you arrive, please make sure to check the return time of the shuttle bus with the information desk on the 1st floor of the grandstand. Taxis: From Gimhae International Airport, a taxi will cost between 15,000-20,000 won. For the return, there is a taxi stand at the racecourse although unfortunately few drivers use it – instead many drivers will be parked around the parking lot and on being approached, will quote a price for a destination. Reasonable prices are 20,000 for the airport and 30,000 for the city – although if you are going to Busan city, a free shuttle bus is preferable. There are three oval tracks at Busan, although only two are used for races, as well as a chute for 1000M races. Unlike Seoul, the track configuration allows Mile races. There is a family park and a lake in the infield and a “Ponyland” petting area on the Grandstand side. 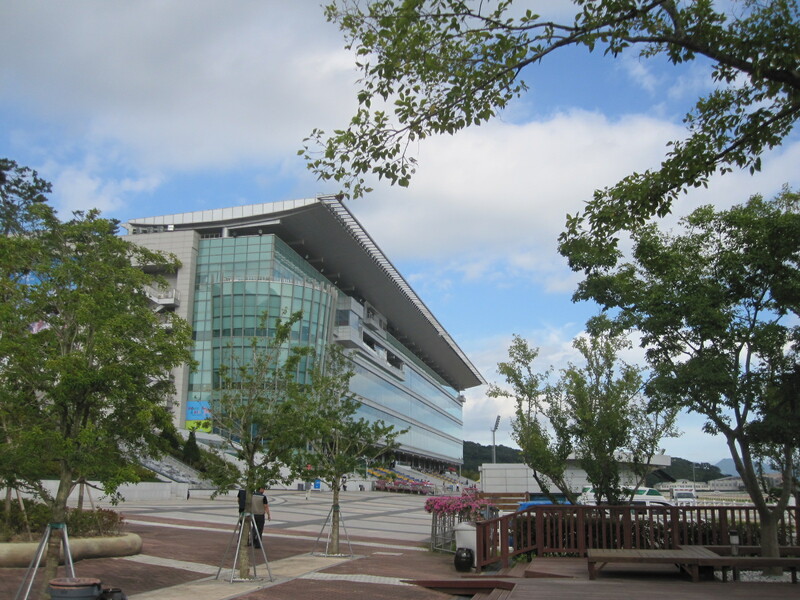 The one Grandstand is a smaller version of the “Luckyville” grandstand at Seoul and can comfortably accommodate 15,000 punters. The track capacity is set at 32,000. There is plenty of seating both outside and inside. A designated betting window is available for foreign visitors on the third floor with English language assistance if necessary. The track is very spacious on Fridays but can get crowded on Sundays. As with Seoul, if you are a serious punter by all means stay in the same place all day and focus on betting. For everyone else, it’s well worth exploring the park. Popeyes (1st floor): Fast food franchise selling reasonably priced though uninspiring meals. Quick service and clean. Unless you’re on the most depressing of diets, make sure you choose the Cajun fries and not the Corn Salad when they ask. Recommended: Well, whatever you like…chicken burger, hamburger. It’s all the same and all costs between 4,000-6,000 won. Ediya Coffee & Book Cafe (2nd floor): While up at Seoul we drink coffee out of a vending machine, the sophisticates at Busan have a branch of the popular coffee chain where they can sip white chocolate vanilla iced lattes while reading a book instead of the form. There is a GS25 Convenience Store on each level of the Grandstand. Outside and in the infield there are Family Mart Convenience Stores. Busan hosts the first leg of the Korean Triple Crown, the KRA Cup Mile – also known informally as the “Korean 2000 Guineas” on the first Sunday of April. In July, the Busan Metropolitan brings some of Seoul’s best imported horses down. The Korean Oaks, in August, has also been run at Busan since 2008.
i have a good CV. Ask for more contact at the turf club autority , mail adresse for jockey licence application forme , for foreigner jockey ( french jockey ) . ACE KOREA looks like he might be a decent sort, based on his 3 consecutive wins at Busan. Do you know where he is likely to make his next start? Is ACE KOREA the only offspring of SMILING TIGER racing in South Korea? His young sire appears to be a standout in California, where he has 4 stakes winners in 2018. Hi, Ace Korea has been nominated for the Korea Sprint (Kor G1) at Seoul on September 9th. Not sure if he will get in or not as his rating is 90 after that latest win. If he doesn’t, I imagine he’d be in a class 1 handicap at Busan around the same time. Smiling Tiger has one other currently racing in Korea to my knowlege, Flashy Miss, who has won 1 from 5 at Busan. She is out of Fast N’Flashy Miss (By Mineshaft). There is also an unraced 2yo colt called Great Win (o/o Indiara by Indian Charlie) and a yearling colt as yet un-named out of Perfect Find (also by Indian Charlie). The were imported in-utero.